#15 NWT Columbia Boys Wind And Water Resistant Jacket Camo XL. Condition is New with tags. Shipped with USPS First Class Package. Up for sale is a great pair of NEW COLUMBIA TRAIL ADVENTURE RAIN pants in a size KIDS, UNISEX x-large. They have an elastic waist with a drawstring. They are titanium, omni tech style. Very light weight. This jacket is fully functional. 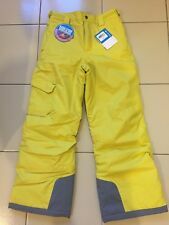 Up for sale is a great pair of NEW COLUMBIA CONVERT ski snow pants in a size small 8. LEG SNOW GUARDS. I do not receive any of the fees they collect. Rise 11” Inseam 25” Waist 27”. Youth COLUMBIA Blue Snowpants Ski Snow Pants Kids Sz L 18/20. Condition is Pre-owned. Small wear and stain in knees. Very light barely noticeable. Please see pictures. Still very nice snow pants. Used 1 season/winter. Adjustable waist. Pockets. COLUMBIA PFG. FSU Seminoles. Small YOUTH. Very good: Previously worn with moderate wash wear/fade, but no visible flaws. Excellent: Previously worn, with only very slight wash wear; no flaws. Good/Play: Previously worn with minor visible flaw(s), and/or significant wash wear/fade. Boys clothes NEW Lot of 14. Condition is New, with the exception of the Columbia Jacket. Shipped with USPS Priority Mail. Sleeve length from shoulder to bottom of sleeve:13.5". Length top to bottom:19.5". Bright colors! STYLE # SH7304. COLUMBIA BOYS’ JAGGED PEAK PARKA. This jacket features an outer shell and a reversible liner jacket:wear them together on snowy winter mornings or apart for more mild weather. Boys Versatile Jacket. Size M (10-12) Youth. A water-resistant shell and 450-fill power down keep the wet out and the warmth in. Down fill insulation. Shell: 100% polyester. Insulation: 450 fill power down. Insulation: Responsibly-sourced down. Good preowned condition. Size is youth large (14-16). Black portion is a nylon like material. Gray portion is fleece. Blue Columbia Sweatshirt Boys Size Youth 6/7. Comes from smoke free home. No stains or tears. Brand: Columbia Youth PFG fishing shirt Color: Blue University of Florida Gators Size: Medium Chest: 18" Length: 22" Florida Gator logo on right chest Florida written on left arm Columbia PFG patch on left chest Vented back and under arm 4 front pockets Button up front with 7 buttons See pictures for full product details. I will be happy to answer any questions you may have. COLUMBIA kids/juniors hoodie sweatshirt. No noted issues.. no odors. Pre-owned condition. Please check out photos for measurements and condition and ask any questions before purchasing.. ** Colors may vary slightly due to lighting..I try to be as accurate as possible ** Thanks for shopping.. I ship quickly. Columbia Black Gray Full Zipper Soft Fleece Spring Jacket Boys 18/20. Condition is Pre-owned. Slight wash wear. No stains or holes. Zipper works great. Shipped with USPS Priority Mail. Up for sale is a boy's Columbia Winter Ski or Snowboarding jacket, size 18-20, XXL. The jacket is pre-owned, but is in excellent condition. There are a few small spots of soiling, but are not major and don't stand out. COLUMBIA CONVERT BOYS COAT. COLOR - TAN KHAKI. NO HOOD - MISSING HOOD. I'M NOT ORIGINAL OWNER. LENGTH BACK COLLAR SEAM TO BOTTOM - 26". ARMPIT TO WRIST - 19". ARMPIT TO ARMPIT - 20". SIZE 14/16.